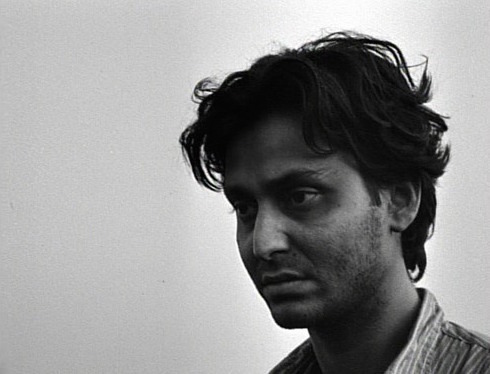 Watching the the restored Apu Trilogy is simultaneously heart-wrenching and soul-restoring. Like many of Ray's works, they are devoid of villainy and sensationalism and instead give full scope to the textures of everyday life and the human experience, which are times are small and fine and at others expansive. There is nothing to avenge and no one to hate or even be disappointed in. There is just life, and you can either be in it or not, and Apu, repeatedly, chooses to live. In addition to that extremely poignant and important thread is the very fact that this restoration exists—that some group of people chose to work on this, chose to devote resources to it, chose to give it back to the world. Humans are demonstrably the worst force to ever act upon this planet, but when we do well, there seems to be at least a shred of hope for us as a species. The films' sadnesses are somehow both crushing (especially at the end of Aparajito, because he is almost an adult, almost demonstrating that he has big enough roots not to fall over, but there is genuine uncertainty) and simply cyclical. That life is both waves and particles is an idea established early on, and it repeats at varying scales. Apu finds himself drawn to "home," but that home changes location. He runs in and out of the front door many times, but at each house one of those times will be the last. There is ceaseless motion full of contrast. The train is a distant wonder; the train is so constantly present that it's painfully loud. The sky is full of fireflies; the sky is full of smoke. Someone is distressingly unknown; that same someone, with a bit of time and effort, is essential and dear. Neighbors are petty and snobbish; neighbors are giving and caring. Life/success and death/failure both occur in all of the locations/homes. People are there to support and protect him until suddenly they aren't, but there will be someone else, maybe someone he wouldn't have expected. So much of what Apu lives and chooses resonates so widely: helping people whose values we do not share, letting past deeds color our feelings for someone, working hard, saving scraps, feeling dark, following light, falling, rising. This trilogy is one of the very few instances in which the male experience really does feel like a (not "the") universal one to me. Apu's life is filled with a diversity of other people—young, old, peer, superior, inferior, family, stranger—and the females in his life affect him just as much as, maybe even more than, the other males. No one person or group excludes anyone else from filtering in. He listens to anyone fairly equitably. It's most visible in the first film because he's a child, but throughout the arc we continuously see his sponge-like but still very analytical self, taking in as much as he can and building his life with it. He's constantly learning. Things do happen to Apu—including very sad and upsetting things that he cannot opt out of—but he responds and is responsible. In fact, responsibility is probably the dominant tone in the last chord of the last film, responsibility to humanity more than to social norms (he acts primarily as a friend instead of as a father). This, to me, is what life is all about: listen, think, engage, be kind. As much as I am enthralled by the films on the big screen, I have to admit that very little of this occurred to me, and certainly I did not feel it as strongly, when I first watched the films at home a few years ago. Aparajito did not resonate with me much at all when I first saw it, but I think now I understand it much better (also aided by the 100+ Bengali films I've watched since then, no doubt). I do believe in the magic of the cinema setting; sometimes it's positively necessary for a film to be particularly worth viewing (for me, this includes many of the spectacle-driven films) and sometimes it's just a plus. 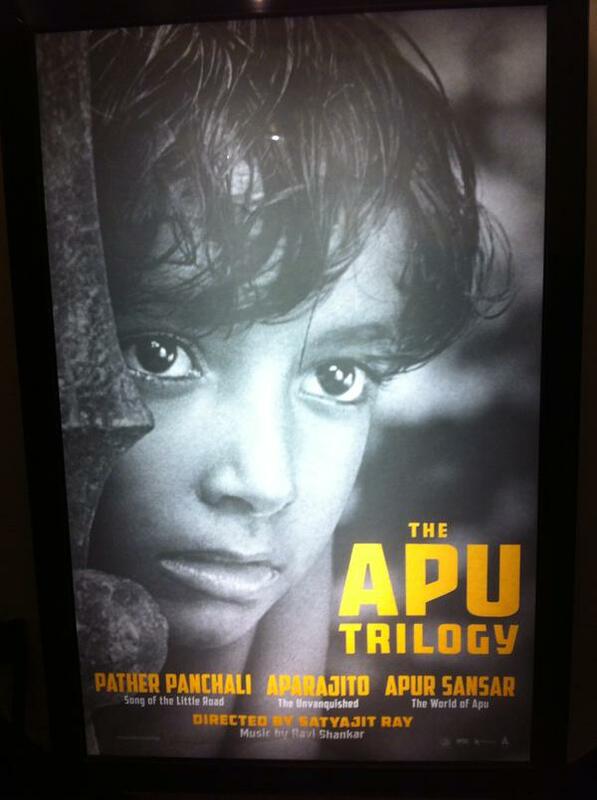 I don't think I'd put the Apu Trilogy into the former category, but for me the films are incredibly more gorgeous and moving on the big screen, and I highly value being part of a group experience and sharing in (and considering) the reactions from other viewers. For example, I think Ray does not get enough credit for being funny, but the frequent laughter in my cinema underscores how well this trait was translating. I read that the restored Apu Trilogy will play at the Mumbai Film Festival this year, and I hope that means more and more international screenings. (There are only US and Canadian dates listed on the official site, for what that's worth.) If you're at all interested in these films and you get the chance to see them in the cinema, please do. They are interesting and thoughtful and gentle and glorious; they are documentation of humanity. In case you haven't seen it yet, a delightful piece from Victor Banerjee on this topic and some others.